Route: From the Ferry Building to Great Highway (eventually), via Market, Geary, 33rd Avenue, Balboa, 45th Avenue and Cabrillo Street. Rail service end: December 29, 1956. Replaced by the 38-Geary motor coach. "B" car making the turn in front of Playland, December 1956. - Courtesy of Jack Tillmany. The B-line started as a shuttle service for the MUNI's A-line cars, extending service west on Geary from 10th Avenue (where the A cars terminated) out to 33rd Avenue. 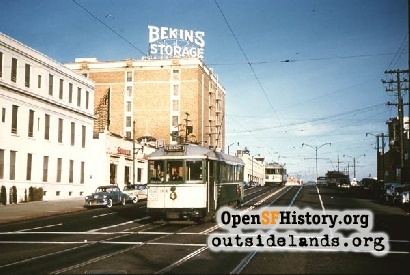 Eventually the B-line became the primary route on Geary, reaching east to the Ferry Building and west to the ocean. 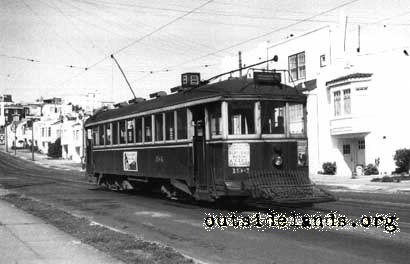 The A-line ended in 1932, leaving the B as the Geary Street workhorse. 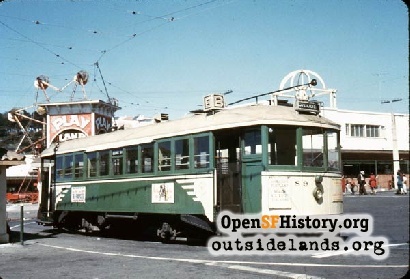 On September 25, 1949 MUNI started substituting buses for night, Sunday, and holiday service. 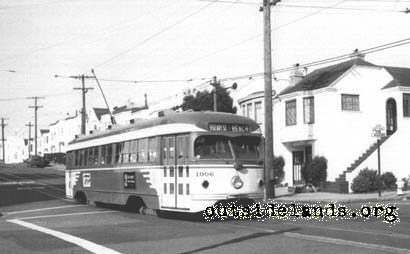 December 29, 1956 was the end of Geary Street rail service with route 38 buses replacing the streetcars once and for all the next day. Read more about Richmond rail service in this article. Car 0194 at 45th Avenue, south of Balboa. March 6, 1946. 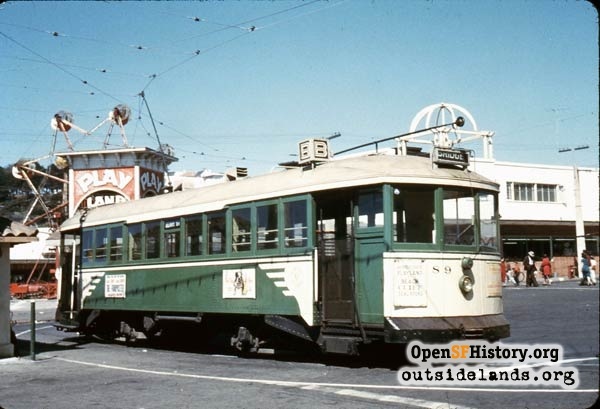 Car M1006 at 33rd Avenue and Anza Street, 1950s. Page launched 3 May 2002; updated 17 November 2006.